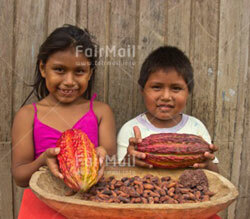 In August the Peruvian FairMail teenagers made an unforgettable journey along North Peru’s Cacao route (see video here). This not only provided a unique insight into the “From Bean to Bar” chocolate producing process. But also resulted in a photo documentary series with amazing photographs of the various production stages and inspiring stories by the cacao bean producers. 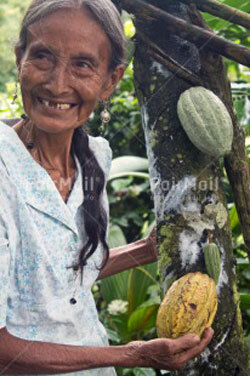 We all got quite inspired by the story of the founder of Mishki Cacao, a female run chocolate producing cooperative. During our visit to their artisanal chocolate factory she explained about the prior negative influence of coca cultivation in the area. This raw material to produce cocaine was an attractive cash crop for many farmers of the Amazon. Unfortunately, the presence of drug traffickers and -producers created an atmosphere that made it difficult for the women to keep their sons and husbands on the right track. 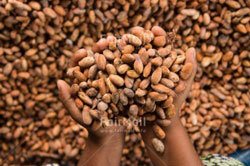 Cacao cultivation was introduced as an alternative source of income, but unfortunately not as profitable as coca. Unless added value could be created in the form of local chocolate production. With this mission in mind the women fought hard to make their dream reality. Now they have their own professional production facilities, sell their chocolate all over the country and have won international awards for their chocolate’s quality. Apart from visiting and photographing Mishki Cacao, the FairMail teenagers also visited the factory of La Orquidea which produces organic chocolate for the export market. And they visited the friendly cacao producers in the jungle village of Tununtunumba to learn more about cultivation and post-harvesting. The teenagers’ images have resulted in a beautiful photo series telling the story behind the delicious chocolate. This photo series is now available for photo exhibitions, marketing campaigns, year reports and chocolate packaging. Please contact us if you are interested to learn more.